The Next Chapter is a civic leadership programme for women of all backgrounds and ages across NI and ROI border counties to develop their ideas, build communities and support the transition out of conflict. The programme aims to improve the representation of women in public and political life and contribute to a more gender-sensitive society. Our challenge was to deliver a new website that effectively communicates the programme’s key information and encourages individuals to register for the programme. We delivered a visually appealing site that clearly presents The Next Chapter’s information and provides a simple registration process for users to sign up to the programme. In collaboration with the Next Chapter we defined the project’s objectives and KPIs at project outset, the objective was to increase awareness and educate users, the KPI was the registration of 300 women within 6 months of site launch (by September 2018). The target audience was women 18+ living in NI and the border counties of the Republic of Ireland. We collated a document that confirmed project teams, roles and responsibilities; a communications plan, a high level in-scope deliverables for design and development, the project budget, project plan including key sign off points, timeframes for delivery, a change control process and an initial risk register. We then undertook a User Experience (UX) discovery period in collaboration with The Next Chapter team. This user focused approach ensured all required site functionality was delivered in an organised, user-friendly way. When the UX process concluded, we defined the functional specification detailing the website structure and functionality. This specification enabled us to develop a clear information architecture, an intuitive user interface and a personalised user experience. 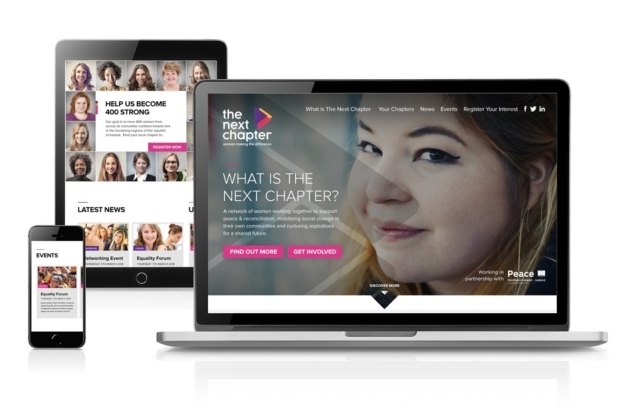 The Next Chapter site is built upon a robust Kentico Content Management System (CMS), as a Kentico Gold Partner we maintain high levels of expertise, design and experience to deliver high quality and technically sound websites. We developed a responsive, accessible, mobile friendly design that encourages users to engage with prominent calls to action and intuitive navigation. The site Design is deliberately simple, clean and uncluttered, allowing for programme information to presented in an interesting and engaging way. The Next Chapter’s brand guidelines and brand palette were adhered to. We ensured primary colours were incorporated within the site’s primary and secondary navigation and across all call to action signposting. We utilised high resolution images representative of the target Audience. We also created a bespoke map to visually present the local Chapter Hub locations. We conducted continuous testing throughout the project: validation testing on the user journeys, site map and information architecture; user testing to ensure the website design operated effectively across different browsers and devices; unit testing on each element of functionality and, prior to deployment and detailed end to end testing. Orchestrated by our Project Management Team, this was meticulously planned to produce a seamless go-live. The new website has played a central role in success achievement for The Next Chapter to date. The website facilitates and supports sustained and meaningful contact between women across the region to encourage them to take the next step into community, politics and public life. The website is the key source of information and support for participants who will lead on the journey from conflict to deliver positive change on issues like good relations and gender equality. The website is the go-to hub for latest news and stories about the project, up to date information on networking events and the all-important training schedule dates for Modules including, ‘Women as Champions of Peacebuilding’, ‘Decision Making, Politics & Public Life’, ‘Developing a Powerful Voice’ and ‘Communicating with Impact’. The initial aim was to secure 300 registrations in the first 12 months post site go live (April 2018), to date (March 2019) 1,048 users have registered to join the programme. An exceptional result for the Next Chapter Team and an encouraging reception from the local community across Northern Ireland and the border counties of the Republic of Ireland.